- What is the Cloud Video Recording? - How do I subscribe to a plan? - How do I unsubscribe from a plan? - How do I update my subscription to a plan? - How do I change my billing information? - How do I view older Timelapses? - How do I view older Cloud Video Recordings? - How do I save a video? What is the Cloud Video Recording? Cloud Video Recording allows you to keep your timeline items and timelapse playbacks for a longer time than the default 2 days. You also have access to continuous recordings of your video stream. 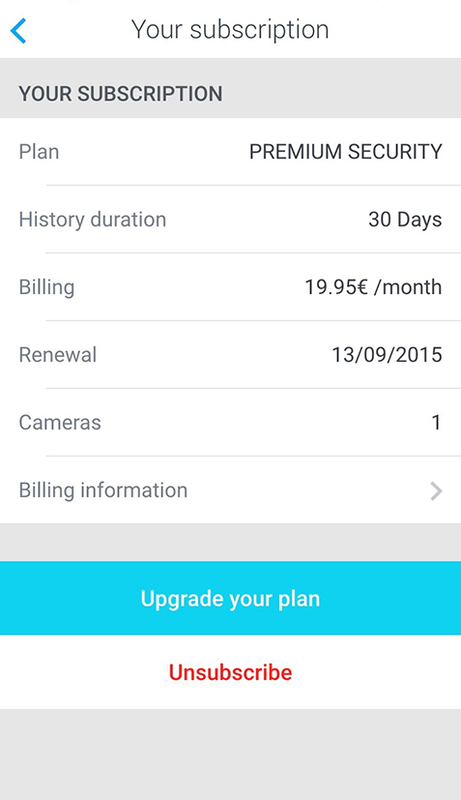 You can then apply your plan to as many cameras as you want on your account for an extra $5 / 5€ per camera. Important: You can't access recordings dating from before your Cloud Video Recording subscription as the plans are not retroactive. Events are recorded starting from the Cloud Video Recording subscription. Tap Start my free trial. Tap the plan you want to subscribe to. 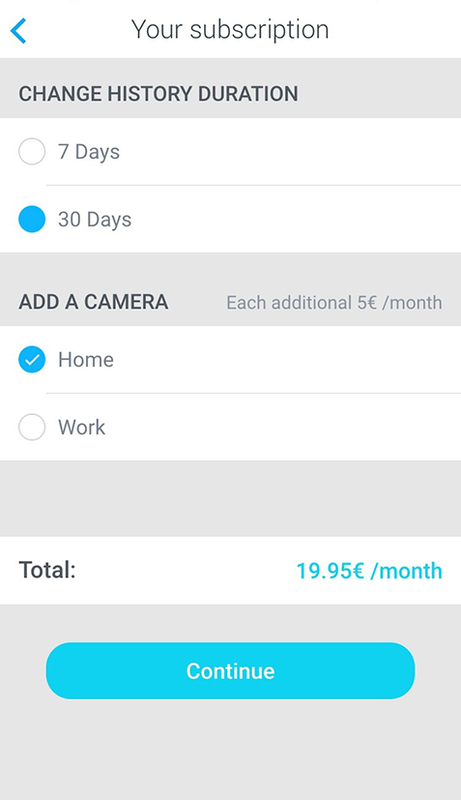 Select the cameras for which you want to activate the plan and tap Checkout. 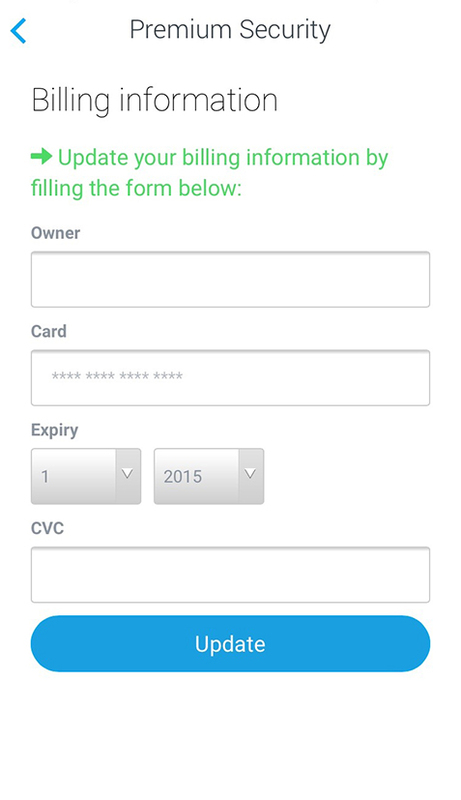 Enter your billing information and tap Start your free trial. How do I unsubscribe from a plan? 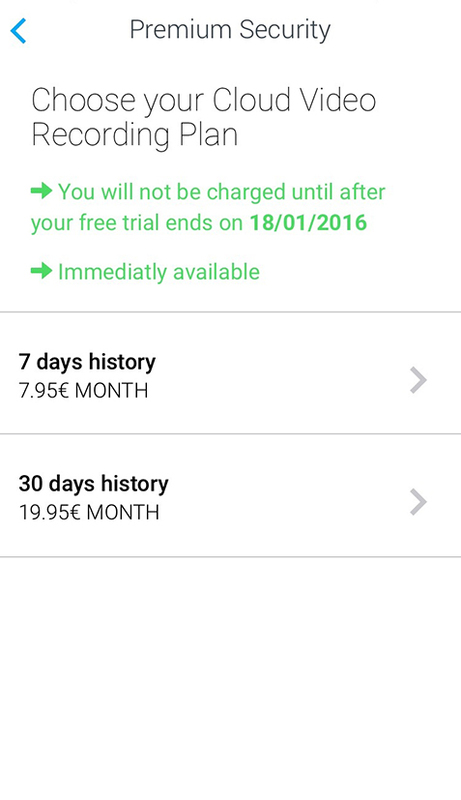 How do I update my subscription to a plan? Select the correct history duration. Add a camera, if necessary. Important note: The videos of your Home will be deleted if you upgrade your Cloud Video Recording plan. Before upgrading your Cloud Video Recording plan, please save your videos. Update your information and tap Update. How do I view older Timelapses? Tap Replay the last 24h in your Journal. Select the date you’re interested in. How do I view older Cloud Video Recordings? Navigate to the timeline at the bottom of the screen until you find the event you're interested in. Tap the blue icon to view the video. Slide your finger on the event you’re interested in your Journal.